I have never been able to help but scoff at the success of bottled water as a concept. There is a rather counterintuitive correlation that I have observed between the popularity of the boutique brands grab-and-go sized bottles and the quality of the local water supply in a given area. The better the stuff you can have for free, the more Lycra-wrapped gym junkies and power-walkers one tends to encounter swigging overpriced imported alleged spring water, hand-bottled from the source on some Himalayan mountain top by a secretive order of blind monks. I take this phenomenon as confirmation of what I have always suspected: that the entire bottled water industry is one of the biggest scams ever perpetrated on an ever-gullible public, driven by several ingenious advertising campaigns that managed to transform something that is literally available on tap for free into a must-have fashion accessory. It would be easy to decry it as a symptom of the vulgar celebrity culture and rampant consumerism that characterises our society – at what other point in history could this happen? Well, once again the nineteenth century has us beat, as I discovered recently. 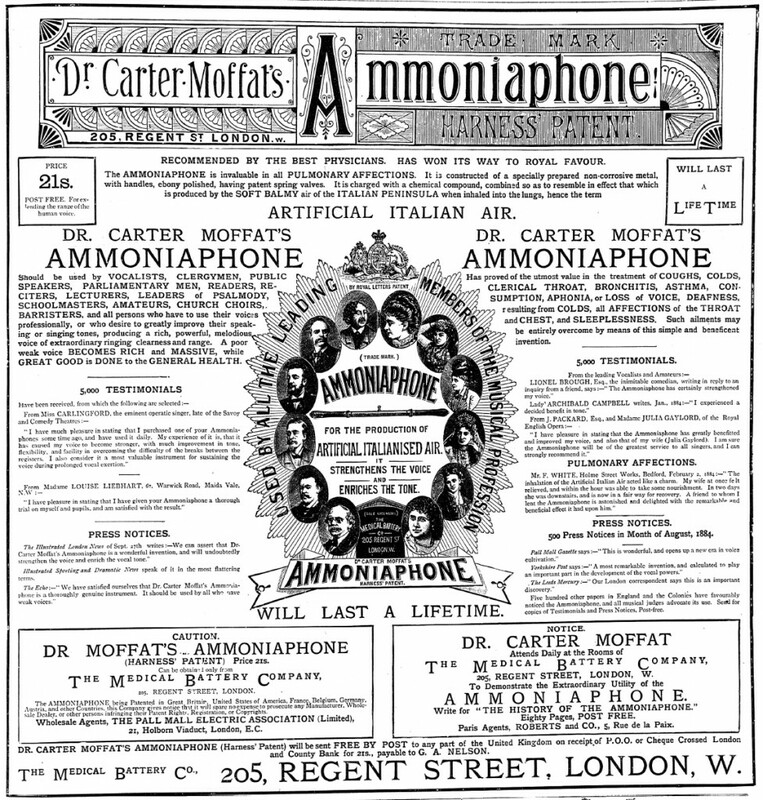 Researching patent medicines can always be relied upon to throw up a few oddball inventions, but my recent discovery of Dr Carter Moffat’s Miraculous Ammoniaphone in the collections of the London Science Museum truly took the biscuit for me. The premise of the Ammoniaphone was that, since Italian opera singers were known throughout the world for the beauty of their voices, it stood to reason that the responsibility for this must have something to do with the quality of the air they breathed. Dr Moffat, a professor of chemistry, claimed to have spent thirty years experimenting with all kinds of chemicals with a view to improving the speaking and the singing voice, and it was during his time in Southern Italy, analysing the air and dew, that he at last hit upon the precise chemical formula that endowed the vegetation with its peculiar yellow-green tint, but also accounted for the “soft, melodious voice of the natives, and the grand balmy air redolent with delicious perfumes”. This was a combination of hydrogen peroxide and, most especially, ammonia, or so he maintained. At first glance, this may seem like an elaborate joke at the expense of the hygiene standards in Italian cities, but I can assure you, Dr Moffat was quite in earnest. Returning home to Glasgow, Dr Moffat continued his experiments and, after nine years of study, placed before the public an instrument that was, effectively, bottled air. Or, as the ads described it, highly concentrated artificially Italianised air in portable condition. 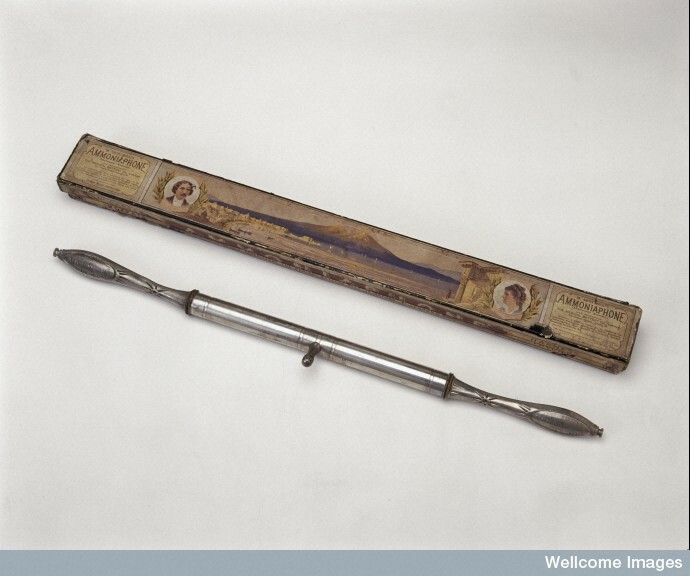 The actual instrument consisted of about a foot of tubular metallic casing around a quantity of absorbent material saturated with Dr Moffat’s patented chemical compound, and a mouthpiece through which a current of air was drawn into the lungs. Aggressively (not to say unscrupulously) advertised, Dr Moffat was able to turn a tidy profit from its sale to vocalists, clergymen, public speakers, choirmasters, schoolmasters, parliamentarians, and enthusiastic amateurs of any of the above vocations, claiming that it would conserve and preserve the voice, expand its range upwards and downwards, and lend it an otherwise unobtainable purity, beauty and richness. Moreover, Dr Moffat conveniently stumbled onto the plethora of medical applications for the device, purportedly invaluable for the treatment of colds, coughs, asthma, aphonia, bronchitis, consumptions, loss of voice, deafness, and all affections of the throat and chest. All for the low, low price of 27 shillings. But wait, there’s more! Once your Ammoniaphone was exhausted, you could send it to the Medical Battery Company to be re-filled – for a small fee. If you’re feeling smug that even if we’ve bought into bottled water, at least we’re not big enough suckers to fall for the Ammoniaphone, don’t get too comfortable. In February this year, it was revealed that a family business in Dorset has started bottling and selling English countryside air at £80 a pop to Chinese connoisseurs who, according to the company’s PR savant, will “pick up different notes of grass, or near the sea… some saltiness in it as well”. The video in this Sky News article shows the process of air harvesting. It also shows that if you have a clever marketing strategy, you really need nothing else at all.